Ice bergs are the solid forms of fresh water floating freely in open water. These are formed on the oceans like Arctic, North Atlantic, and Southern Oceans. Icebergs float in salt water. The size of icebergs varies widely. There can be small bergs which are known as “growlers”. Also there are slightly larger bergs which are known as “bergy bits”. The tallest known iceberg in the North Atlantic was 550 feet (168 m) above sea level. The bulk of an iceberg is below the water and the entire berg was estimated to be as tall as a 55–storey building. Classification of icebergs based on length/height and shape is provided next. Different types of icebergs A fantastic variety of shapes result from both the formation and deterioration processes of icebergs. The following table shows the size categories of the icebergs found in the North Atlantic Ocean. An iceberg is classified based on the mass of ice which must be greater than 15 m long or 5 m in height. Icebergs are not only classified based on their length and height but also based on their shape. Tabular icebergs have steep sides and a flat top and they look like a plateau, on good observation. 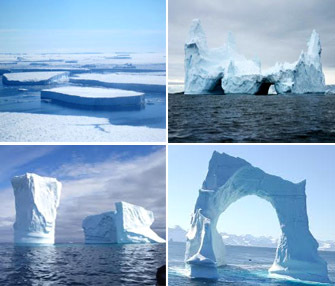 There are non–tabular icebergs which include irregular shapes. Most of the time, wind and water erode icebergs into amazing sculptural shapes. Blue color of icebergs due to scattering of light Icebergs may also appear blue due to light refraction and age. Older icebergs reveal vivid hues of green and blue, resulting from a high concentration of color, microorganisms, and compacted ice. What gives Icebergs their Colors? Most of the icebergs are white in color, but some may appear blue. Ice contains huge amount of tiny air bubbles that scatter almost all wavelengths of light, which gives the ice a white appearance. When ice gets compressed then, the bubbles get squeezed out and the blue light gets scattered much more than any other colors. 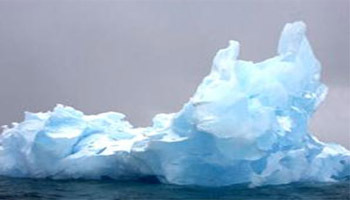 Hence the Iceberg appears in blue color. An iceberg can be of other colors too. Some icebergs in Antarctica are green because the ice shelves they come from have seawater frozen inside that contains yellow, brown and green colors. When the blue iceberg melts and exposes the colored organic matter, the iceberg may look a different color. Icebergs contain pure water in solid form even though it stands on the oceanic salt waters Ice is formed only of pure water and salt has no room in the ice crystals. Let us understand why ice floats. We all know about the concept of density which is mass per unit volume of a substance (o) D = M/V). Density describes the packing of atoms in a substance. The substances which have high density usually consist of tightly packed atoms, and the substances with low density have spread out atoms. Density is the defining property of a substance, it is constant, irrespective of the amount of matter present. When water freezes, the water molecules spread out to align in a definite crystalline structure and so water expands as it freezes. We would have noticed sometimes the bump on an ice cube or a can of soda explode in the freezer. It is due to the same reason that water expands as it becomes a solid. Thus ice (solid form of water) takes up more space (greater volume) than the liquid water. The only difference is that the amount of matter will not change but it spreads out over a larger space. 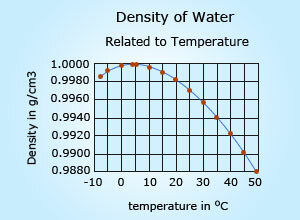 This means that the density of ice (0.92 g/mL) is less than that of liquid water (1.0 g/mL). Hence ice floats in water. 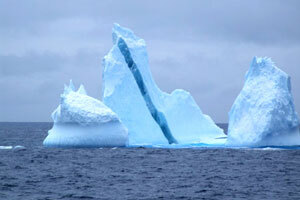 How icebergs consist of pure water as they are formed in oceanic salty water? Most part of the icebergs are formed from fresh water. Due to the slow freezing of ice and its crystalline structure, ice will not allow the salt water inclusions to be incorporated during its formation. Density of water at different temperatures Icebergs float in water because the liquid form of water is denser than the solid form and also contain a lot of air. When you throw an ice cube in a glass of water, it will float. An iceberg is nothing but a giant ice cube. Floating has nothing to do with size but all with weight. So the floating of an iceberg is just the same as floating of an ice cube. When you take 1 litre (=1000 cm3) of water and weigh, it weighs 1 kilogram. When you weigh 1 litre of ice cubes, you will find that the ice cubes weigh less than a kilogram. From 50°C to 4°C, water gets heavier (i.e. the density rises) from 0.988 to 1.0 grams per cm3. When water gets colder than 4°C it becomes lighter. At 0°C it becomes ice and it weighs 0.9998425 grams per cm3. This is called anomalous expansion of water. The water temperature in the polar areas is 4°C at maximum, so icebergs will float. When an iceberg reaches warm waters, the new climate attacks it from all sides. On the iceberg surface, warm air melts snow and ice into pools called melt ponds that can trickle through the iceberg and widen the cracks. Most icebergs actually contain a lot of air. Far from being the solid blocks of ice many people imagine, icebergs are riddled with billions of tiny, trapped air bubbles, giving the huge bergs their white appearance. Another aspect is the salinity of the seawater. Icebergs are made from fresh water. Because of the dissolved salts in ocean water, it is denser than freshwater. Salty ocean water weighs 1.025 grams per cm3, making the iceberg even easier to float. Icebergs are formed when few chunks of ice calve, or break off, from glaciers, ice shelves, or a larger iceberg. These icebergs travel with ocean currents, across the oceans or sometimes smashing up against the shore or getting caught in shallow waters. Parts of iceberg above and below ocean surface Because of the density of pure ice is about 920 kg/m³, and that of sea water about 1025 kg/m³, typically only one-tenth of the volume of an iceberg is above water. The shape of the underwater portion can be difficult to judge by looking at the portion above the surface. 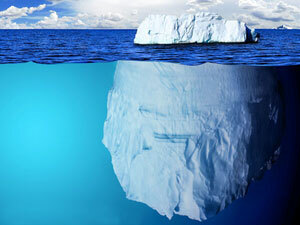 Why is most part of the icebergs found beneath the ocean&apos;s surface? Let us seek again the concept of density to answer this question. The densities of ice and sea water are so close in value. Remember that the density of ice is 0.92 g/mL, and the density of water is 1.0 g/mL (1.03 for salt water). 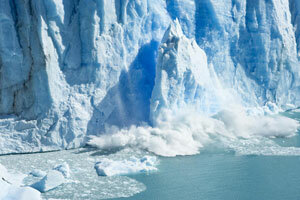 This means that ice has nine–tenths or 90 percent of water&apos;s density roughly. Hence 90% of the iceberg is below the water&apos;s surface. Another explanation can be given in relation to buoyancy. An object is said to be buoyant (floating) if its relative density is less than that of the fluid it is resting in. Hence we can say that ice is buoyant as it has a slightly lower density than seawater. However, due to the negligible difference in relative density between ice and sea water, only some of the iceberg floats above the water. On average only 1/10th of an iceberg is above the surface of the water. Despite only a fractional part being above the oceanic surface, icebergs pose a danger to ships traversing the North Atlantic and the waters around Antarctica. After the Titanic sank near Newfoundland in 1912, the United States and twelve other countries formed the International Ice Patrol to warn ships of icebergs in the North Atlantic. Why do scientists study icebergs? The climate scientists study icebergs as they break up for clues to the processes that causes the ice shelf collapse when they reach warmer waters. By studying the factors that cause icebergs to break up, researchers hope to better understand the influences that lead to ice shelf breakup, and to better predict how ice shelves will respond to a warming climate or global warming. Oceanographers always follow the icebergs because they contribute the cold freshwater to the sea and they can also influence currents and ocean circulation far away from their origins. 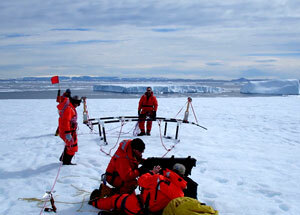 Biologists also study icebergs to find out how they influence ocean life and in what way. As icebergs melt, they leak nutrients into the ocean around them. Recent studies have shown that the water surrounding icebergs teems with plankton, fish, and other sea life. Any discussion about icebergs would be incomplete without a reference to the disaster in 1912. RMS Titanic, the largest passenger liner with over 2,200 people on board, embarked on its maiden voyage from Southampton to New York City on 10th April. Travelling at a speed of 22 knots and not sighting an iceberg early enough, the ship suffered a glancing blow that buckled her starboard. It perished on 14th April along with over 1,500 passengers and crew. The film Titanic (1997) is a fictionalized version of the shipwreck that won several Oscar awards.